Steamboat's Hanson Buchner and Moffat County's Alex Perez battle for a ball Thursday. Steamboat won the game, 4-1. 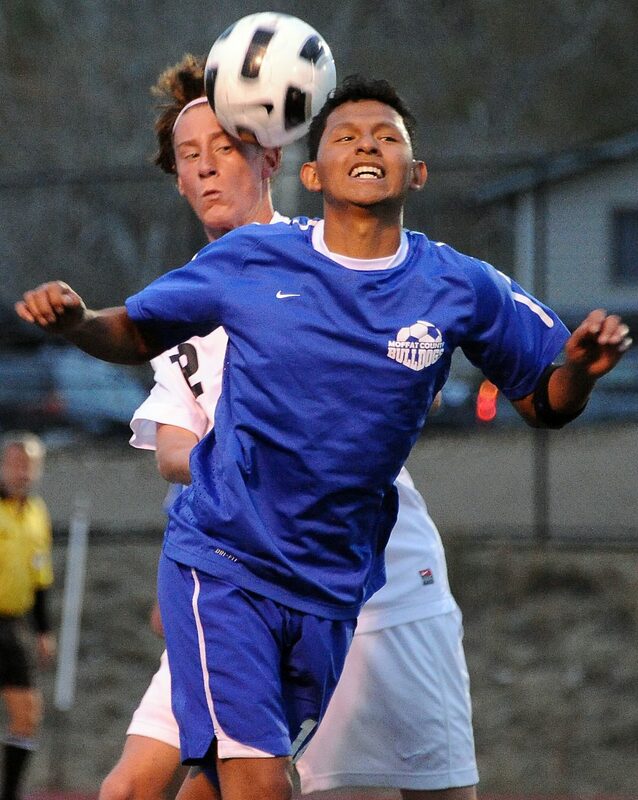 Steamboat Springs — Things could have been close midway through Thursday’s Steamboat Springs vs. Moffat County High School soccer game. Steamboat led 2-0 at half, but Moffat wasn’t given what appeared to be one early goal when a ball deflected off the crossbar and seemingly on goal side of the line. Several other Bulldog attempts ended up as near misses, including one long-range missile barely tipped away by Sailors’ goalie Carter Kounovsky. However close things may have been at that point, things weren’t close at all after the second half. Steamboat only added two more goals, but the game’s last 40 minutes were defined by Sailors streaking toward the goal. It was an offensive assault that netted Steamboat a 4-1 win against it’s U.S. Highway 40 rival. “We really started to focus, got together as a team and stepped up our game,” Steamboat’s Mac Noel said. Moffat County’s goal came in the game’s waning seconds. Alan Flores smashed home a penalty kick to erase the shutout, but by that point, it was far too late for the Bulldogs. Moffat coach Rusty Cox pointed to a roster depleted by illness, injuries and Thursday night’s Moffat football game. “We were very short handed,” he said, careful with his words as frustration, particularly concerning the non-goal in the first half, simmered. According to Steamboat, the difference between a could-have-been-close first half and the shots-galore second half was focus. The defense limited Moffat’s opportunities and time and time again sent the ball the opposite way. Peter White and John Vande Velde scored in the first half, and Vande Velde had two quick opportunities in the second, narrowly missing both. He just missed again, a header on an indirect kick floating just over the goal, before finally connecting in the 58th minute. The Sailors had several more close chances, players scrambling after balls, before Noel made it 4-0 on an assist from White. “We were getting frustrated. We had more than enough opportunities to put that game away, but finally we did,” Noel said. Steamboat improved to 8-5 with the game, the first step in what needs to be a very sure-footed sprint to the end of the regular season if the Sailors are to earn a playoff berth. They return to action at 6 p.m. Saturday at home against Glenwood Springs. It’s the final home game of the season. Moffat, 5-7, plays Saturday at Aspen.